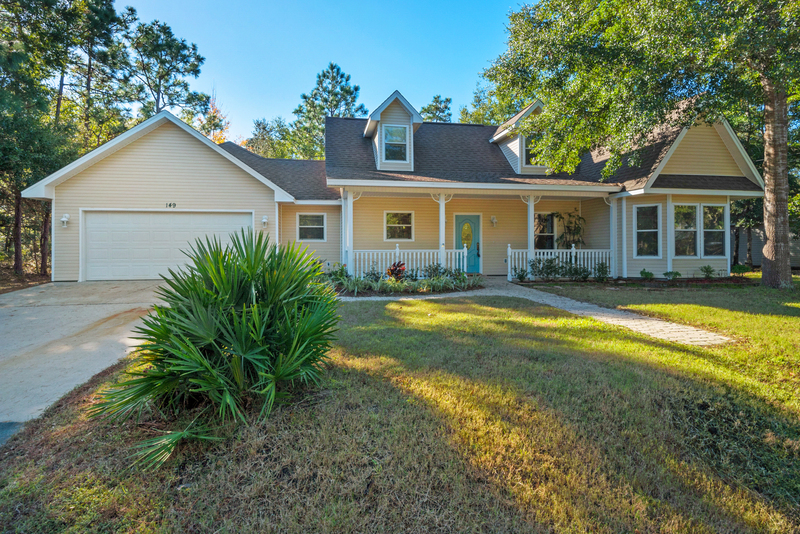 149 W. Wild Briar Rd., Mack Bayou, Santa Rosa Beach Florida sold in just 36 days! 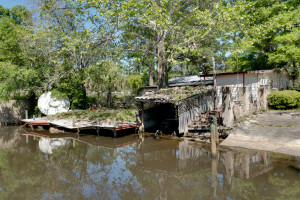 This unusual property with an apartment upstairs was on a canal that leads to Mack Bayou. Offered for sale numerous times in the past and on and off the market, Wendy Rulnick, Broker, effected the final sale when the sellers listed with Rulnick Realty. 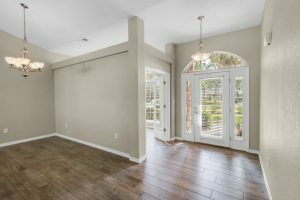 What factors cause a fast sale? This Mack Bayou home was not an easy property to sell. It had a floor plan that appealed to a limited market and needing updating. Wendy Rulnick accomplished the task. If you have an “easy” property to sell, there are hundreds of real estate agents you can call. If your property presents a sales challenge because of its floorplan, condition, high price, difficult sales circumstances, multiple owners, divorce or short sale, call Wendy. 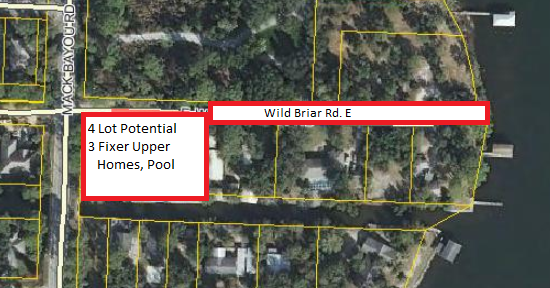 Investment opportunity in South Walton County! Waterfront home on canal with Apartment in Mack Bayou area at 149 W. Wild Briar Road, Santa Rosa Beach Florida is now for sale. Boat out to the Choctawhatchee Bay from the canal. The second floor of this house has a separate studio apartment of 520 SF with kitchenette and full bathroom for rental income. The apartment is accessed from the rear with a separate entrance. It has a granite kitchenette, bathroom and open concept floorplan. This Mack Bayou home has 100′ feet on the water with room enough for a 19′ center console boat to jet out to the Choctawhatchee Bay. The main house has a welcoming porch, 9′ ceilings, recessed lighting and open kitchen with maple cabinets and stainless steel appliances. The airy floorplan has architectural details such as a barrel ceiling in the master bath. The canal front setting is framed by plentiful windows. The second floor deck off the apartment is a tree top retreat of seclusion. 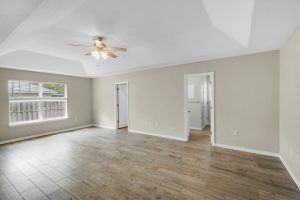 Recently painted main house has 3 bedrooms, 2.5 baths. 100 feet on canal, second floor deck. Potential rental income $2000 for house or more, $800 to $1000 for studio apartment per month. 149 W. Wild Briar Road is offered for sale for $429,900. This Mack Bayou area home at 43 Shipwreck Rd. 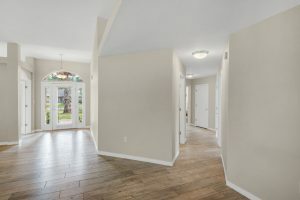 E in Driftwood Estates, Santa Rosa Beach, Florida, impresses with grand, open living spaces. Almost 3000 square feet, it has four bedrooms, three full bathrooms and a separate office. New wood tile floors flow from room to room offering incredible lifestyle arrangements for multiple seating areas. 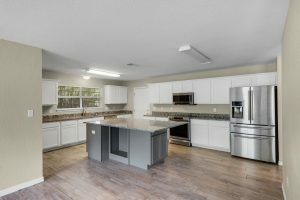 Upgrades of almost $60,000 include the stand-out kitchen with an enormous granite center island. Two chefs could put on quite a show cooking here. 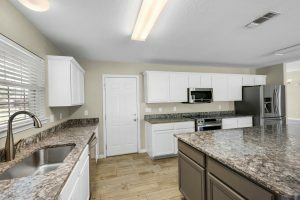 The cabinetry is remodeled, all counters are granite and appliances stainless. The dream walk-in pantry will hold every exotic spice, canister and staple to plate meals of your imagination. 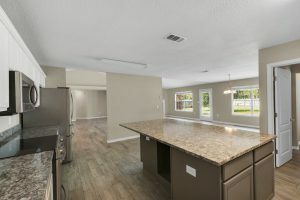 This Driftwood Estates home has been newly painted, the bathrooms have updated granite and faucets. The eye-pleasing style with plant ledges, cathedral ceiling and light-bathed neutrals decorate this stunning Santa Rosa Beach home. Five minutes away find Sacred Heart Hospital, dining and shopping opportunities. 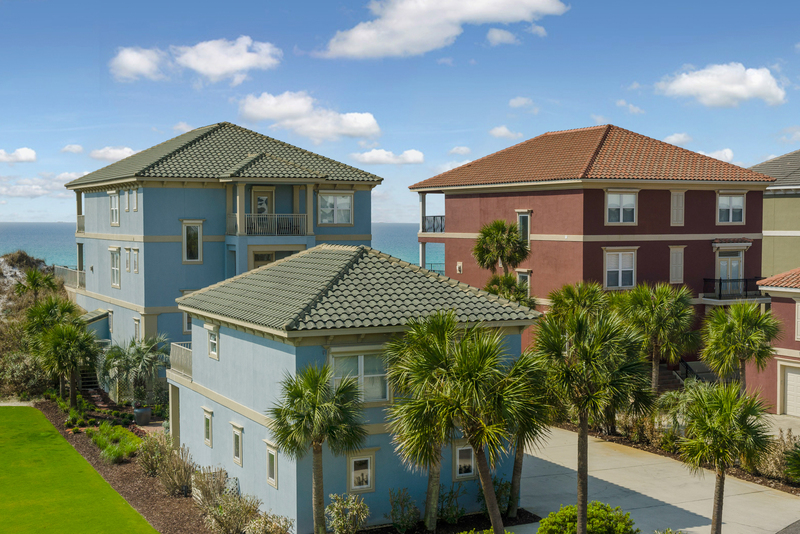 Take a 15 minute drive to Grand Boulevard in Sandestin, which has a movie theater, famed Emeril’s Coastal Italian, Vin’tij restaurant and more, the Village of Baytowne Wharf, or the beaches of South Walton and the Gulf of Mexico. 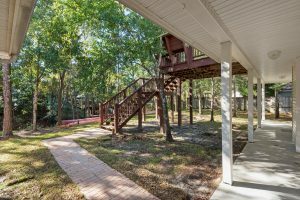 The more than half-acre estate sized lot is cleared and level, backing up to nature preserve with bird-filled woods. It invites relaxing, playing with children or pets, planting a garden and fenced privacy. 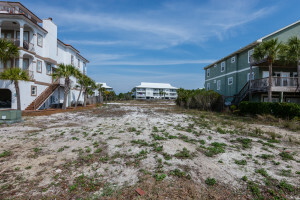 43 E. Shipwreck Rd., Driftwood Estates in Santa Rosa Beach Florida is offered for sale for $429,900. 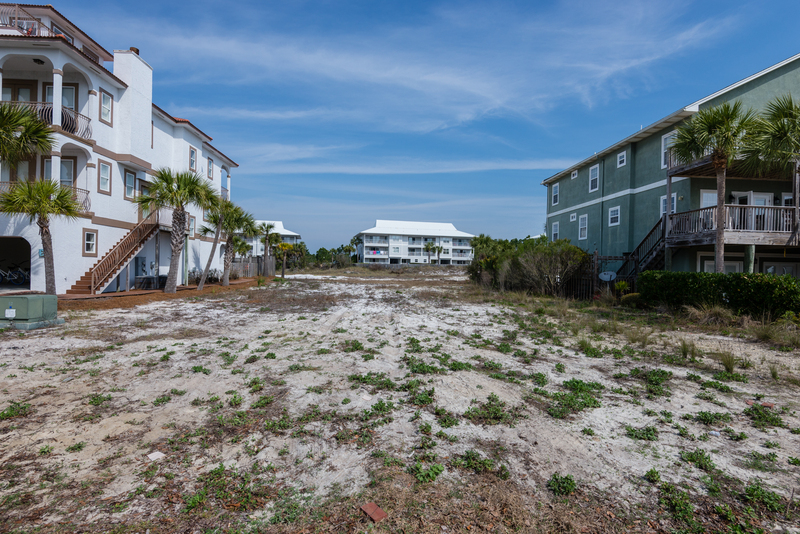 Are you just itching for a new creative, potentially money-making real estate project in South Walton County? 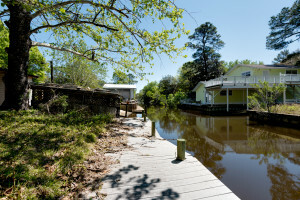 Here are two new listings in Santa Rosa Beach, Florida, on the canal, adjacent to each other, that can be an investor’s dream! 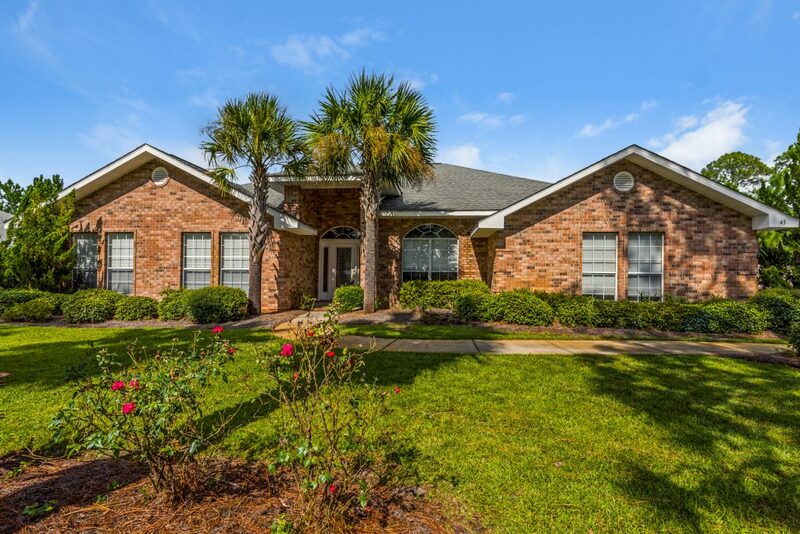 Owner wants OFFER – ready to sell! GREAT VISIBILITY RIGHT OFF MACK BAYOU!!!!! Contact me and let’s brainstorm… It’s Wendy… It’s Sold! Seriously? Yes! 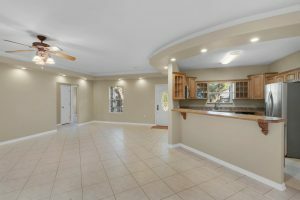 This Mack Bayou home is a “handyman special”! 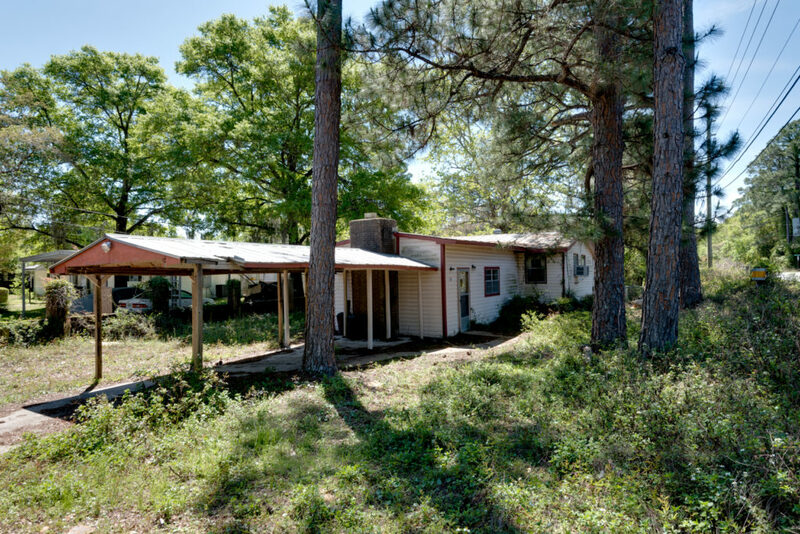 Inhabited as recently as last year, this 1970’s circa home needs a lot of work, but we all know it’s about… LOCATION!! 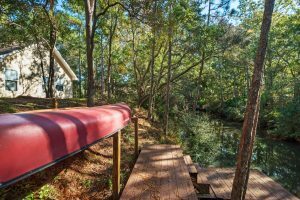 Set on a canal with 50 feet of frontage, you can be out to Mack Bayou and Choctawhatchee Bay in moments, with your fishing pole and sun block! Imagine having a waterfront bungalow or fixing it up to re-sell. 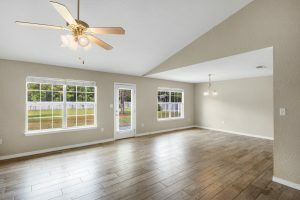 The canal front setting, affordable price, opportunity and location close to Sacred Heart Hospital, myriad shopping and dining venues, beach or boating out to Choctawhatchee Bay from your own property make this home ideal for an investor or ambitious homeowner. Seller wants offer! 10 Wild Briar Rd. E., Santa Rosa Beach Florida is offered for $131,900. The holidays are rapidly approaching, and we’re all looking for fun ways to celebrate with our family and friends. Below I’ve compiled a list of holiday events in Destin and the surrounding area. To keep up with the latest local tips, sign up for my newsletter here! Sunday, November 15 (11:00 AM – 4:00 PM) – ARTWalk (HarborWalk Village) | Features dozens of local artisans and craftspeople along this open air waterfront boardwalk. It’s a vibrant marketplace, bustling with street performers and live music. Thursday, November 19 (5:30-8:00 PM) – 3rd Annual Bourbon at the Bay (Regatta Bay Golf & Yacht Club) | Sip on bourbon, scotch, and champagne, enjoy hors d’oeuvres, and start your holiday shopping early with their silent auction. Friday, November 20 (6:00-8:00 PM) – Santa’s Arrival (Destin Commons) | Destin Commons and Bass Pro Shops welcome Santa to light the tree! Character photo opportunities and live entertainment with Sinfonia and festive carolers. Sit back and marvel at a holiday parade with Santa and fireworks! Thursday, November 26 (11:00 AM – 7:00 PM) – Thanksgiving with Harbor Docks and Habitat (Harbor Docks) | Harbor Docks will open their doors for the 21st Anniversary of Thanksgiving with Habitat for Humanity to provide a complimentary traditional dinner for you. This invitation is open to everyone, whether you plan to spend the holiday alone or with family and friends. Thursday, December 3 (6:00-7:00 PM) – Destin Christmas Tree Lighting (Destin Community Center) | The 29th Annual Christmas Tree Lighting is hosted by the City of Destin. This will be an outdoor event for the entire family with a visit from Santa Claus. There will be entertainment from local choruses, musical groups, dancers, etc., with refreshments being served after the lighting of the tree. Donations of toys and canned food will be collected for families in need. Friday, December 4 (7:00 PM) – Sounds of the Season Christmas Concert (Village Baptist Church) | Doors open at 6:00 PM. Admission is a donation of an unwrapped child’s toy to be distributed among the participating churches’ outreach ministries to provide a brighter Christmas for families in need during the holidays. A love offering at intermission will benefit Mattie Kelly Arts Foundation’s “All Kinds of Art,” a children’s educational outreach program inspiring students and special needs children in Okaloosa and Walton Counties. Saturday, December 5 (2:00-4:00 PM) – Emerald Coast Theatre Company’s “A Dickens Christmas” (HarborWalk Village: Veranda Room) | Experience a unique adaption of Charles Dickens’ famous story “A Christmas Carol” in this up close and intimate setting. Three talented professional actors seamlessly change from character to character as they bring to life the tale of Scrooge and his transformational night with three ghosts. Make this special evening a new holiday tradition as you share cookies and tea with family and friends in a cozy, festive atmosphere. Saturday, December 12 (10:00 AM – noon) – Destin Christmas Parade | The floats will start by Old Time Pottery and travel west down Harbor Blvd to Nightown. Saturday, December 12 and Sunday, December 13 (noon – 4:00 PM) – Holiday ArtWalk | The Destin Harbor is full of holiday cheer! Local artists, passionate designers, creative personalities and all day entertainment turns HarborWalk Village into a vibrant and bustling outdoor art gallery for a special edition Holiday ArtWalk. Stop by the main stage and visit with Santa. Saturday, December 12 (2:00-4:00 PM) – Emerald Coast Theatre Company’s “A Dickens Christmas” (HarborWalk Village: Veranda Room) | Experience a unique adaption of Charles Dickens’ famous story “A Christmas Carol” in this up close and intimate setting. Three talented professional actors seamlessly change from character to character as they bring to life the tale of Scrooge and his transformational night with three ghosts. Make this special evening a new holiday tradition as you share cookies and tea with family and friends in a cozy, festive atmosphere. Sunday, December 13 (6:00 PM) – Destin Boat Parade | The Destin harbor will be dancing with holiday lights and cheer during the 28th Annual Destin Boat Parade. Saturday, December 19 (2:00-4:00 PM) – Emerald Coast Theatre Company’s “A Dickens Christmas” (HarborWalk Village: Veranda Room) | Experience a unique adaption of Charles Dickens’ famous story “A Christmas Carol” in this up close and intimate setting. Three talented professional actors seamlessly change from character to character as they bring to life the tale of Scrooge and his transformational night with three ghosts. Make this special evening a new holiday tradition as you share cookies and tea with family and friends in a cozy, festive atmosphere. Friday, December 11 (7:30 PM) – A Peter White Christmas (Emerald Coast Convention Center) | A Peter White Christmas featuring Rick Braun and Mindi Abair. 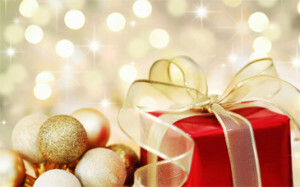 Smooth jazz and jingle bells return to the Emerald Coast in this unique blend of contemporary jazz and holiday music. Purchase tickets early, as this event often sells out. Friday, November 20 (5:00-8:00 PM) – Christmas Jingle & Marketplace (Gulf Breeze Community Center) | Get into the holiday spirit with the beautiful lights, decorations, music, and fun with Santa. They will have arts and crafts available from area vendors. Saturday, November 21 (10:00 AM – 2:00 PM) – Christmas Jingle & Marketplace (Gulf Breeze Community Center) | Get into the holiday spirit with the beautiful lights, decorations, music, and fun with Santa. They will have arts and crafts available from area vendors. Saturday, November 21 (7:00-11:00 PM) – Festival of the Trees Gala (Gulf Breeze Community Center) | Santa Rosa Kids House live auction, cocktail attire, dinner buffet, and dancing. Purchase tickets online. Saturday, December 5 (2:00 PM) – Annual Navarre Community Christmas Parade | The theme this year is “Christmas in Candyland.” The parade will begin at the Navarre Library, traveling south and ending behind Centennial Bank. Friday, November 20 (7:30 PM) – Messiah and More Concert (St. Paul Lutheran Church) | Performed by Northwest Florida Symphony Chorale. Friday, November 20 and Saturday, November 21 (7:30 PM) – The Nutcracker Ballet (Mattie Kelly Arts Center at Northwest Florida State College) | Tickets are $35 for adults and $17 for children (12 and under). Sunday, November 22 (2:30 PM) – The Nutcracker Ballet (Mattie Kelly Arts Center at Northwest Florida State College) | Tickets are $35 for adults and $17 for children (12 and under). Friday, November 27 through Sunday, December 27 (6:00-9:00 PM) – Christmas Lady’s Niceville Christmas Display (in the former K-Mart location in the Oak Creek Shopping Center) | “Animation in Motion” is open seven nights a week! Monday, November 30 through Sunday, January 3 (6:00-9:30 PM, until 10:30 PM on Fridays and Saturdays) – Geek Lights (corner of Bluewater Boulevard and Antiqua Way) |A popular Niceville Christmas lights display and music show, beginning on the hour and half hour. Consists of Christmas lights and other themed display elements, all under computer control and synchronized to stories and music. This year’s display features approximately 85,000 lights, driven by nearly 300 computer controlled circuits. Friday, December 4 (7:30 PM) – A Christmas Carol in Concert (Mattie Kelly Arts Center) | Early ticket purchase is strongly recommended as the event has sold out the last several years. Saturday, December 5 (10:00 AM) – Niceville Christmas Parade | The theme is “100 Years of Christmas in Okaloosa County.” The parade starts at the intersection of State Road 20 and Palm Boulevard and makes its way down State Road 20 to Partin Drive, where it turns right. The parade then continues on Partin Drive past Ruckel Middle School. Saturday, December 5 (2:00 PM and 7:30 PM) – A Christmas Carol in Concert (Mattie Kelly Arts Center) | Early ticket purchase is strongly recommended as the event has sold out the last several years. Friday, December 11 (7:30 PM) – Holiday Pops (Mattie Kelly Arts Center) | Ring in the season with all your holiday favorites as the Northwest Florida Symphony Chorale, and the superb voices of the NWF State College Belle Voci and Madrigal Singers. Tickets for $25/adult and $18/youth or active duty military. Tuesday, November 24 (2:00-3:00 PM) – “Every Christmas Story Ever Told” Live Theatre (North Barrett Square or The Pearl Ballroom if raining) | Don’t miss the Seaside REP’s smash hit “Every Christmas Story Ever Told,” showcasing all your favorite beloved holiday classics crammed into a performance full of high-energy jolly, frivolity, and hilarity. Fun for the whole family! Chairs and blankets welcome. Friday, November 27 (6:00-6:30 PM) – Rosemary Beach Tree Lighting Ceremony | Don’t miss the excitement as we “turn on the town!” Enjoy musical performances by the Charles Dickens Carolers, see Santa’s big arrival, and take a carriage ride through town. Saturday, November 28 (9:00 AM – 5:00 PM) – Holiday Market | Vendors will be selling holiday decorations, gifts, jewelry, handcrafted furniture, art, and more! Saturday, November 14 (5:00 – 7:00 PM) – Sparkling Wine & Holiday Lights (The Village of Baytowne Wharf) | Stroll the streets, lined in twinkling lights and greenery, while sipping champagne and sampling featured menu items. And, you can enjoy a sneak peek of our tree lighting! Sunday, November 1 through Sunday, January 31 (hours vary) – Baytowne on Ice (The Village of Baytowne Wharf) | This seasonal treat is a great way to get into the holiday spirit! Open daily. Friday, November 20 (7:00-10:00 PM) – Horizon Stars Fashion Show, “Winterland!” (Linkside Conference Center) | Be entertained by great talent while supporting a wonderful cause. Friday November 27 (6:00 PM) – Polar Express (The Village of Baytowne Wharf) | Watch the Christmas movie under the stars. Saturday November 28 (6:00-9:00 PM) – Here Comes Santa Claus (The Village of Baytowne Wharf) | The main event! They’ll have kids activities and live music. Santa Claus arrives at 6:00, followed by a fireworks show! And don’t forget to snap a photo with Santa, until 9:00! Wednesday, December 2 through Saturday, December 26 (6:00 and 7:00 PM) – 12 Nights of Lights (The Village of Baytowne Wharf) | For the month of December, enjoy a festive light show set to your favorite holiday music every Wednesday, Friday, and Saturday evening leading up to Christmas. Saturday, December 12 (5:00 PM) – Tuba Christmas & Holiday Lantern Parade (The Village of Baytowne Wharf) | At 5:00, enjoy a free concert by Playground Music Center. At 6:00, individuals and groups are invited to participate in a lantern parade. Saturday, December 12 and Sunday, December 13 (7:00 AM – 5:00 PM) – Tee Off For Toys (Raven Golf Club, Baytowne Golf Club, or The Links Golf Club) | Donate a new or unwrapped toy or gift card with a value of $15 or more and in exchange resort guests or visitors can play Sandestin’s public golf courses for just the greens/golf car fee of $20. Saturday, November 21 (5:00 PM) – The Nutcracker (Seaside Ampitheater) | Performance by local area dancers and Ballet Pensacola. Saturday, November 28 (4:00 PM) – Turn on the Town | Christmas parade, Santa, music, and more! Saturday, December 19 (5:30 PM) – Holiday Pops Concert (Seaside Ampitheater) | Special holiday performance from the Pensacola Symphony Orchestra. Saturday, December 12 (10:00 AM – 4:00 PM) – Yule of Yesteryear (Heritage Museum of Northwest Florida) | Walton Guard re-enactment Christmas 1861, Santa, vendors, entertainment, and more! Saturday, November 28 (5:00-9:00 PM) – Old Florida Holiday & Winter Market | This is a holiday extravaganza complete with falling snow, horse-drawn carriage rides, s’mores, Santa, luminaries, and a winter market! Questions? Give me a call! Wendy Rulnick, Broker, has been featured in “Kiplinger Personal Finance Magazine” and “Florida Realtor Magazine”. 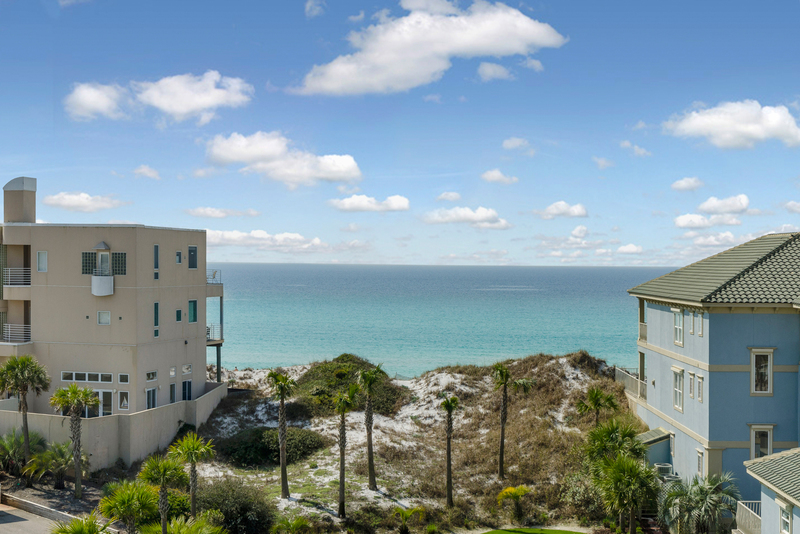 Wendy Rulnick sells real estate in Destin, Santa Rosa Beach, 30A, Miramar Beach, Seagrove Beach, Watercolor, Sandestin, Seaside, Crestview, Rosemary Beach, Mary Esther, Shalimar, Fort Walton Beach, Niceville, Bluewater Bay, Navarre, Panama City Beach. 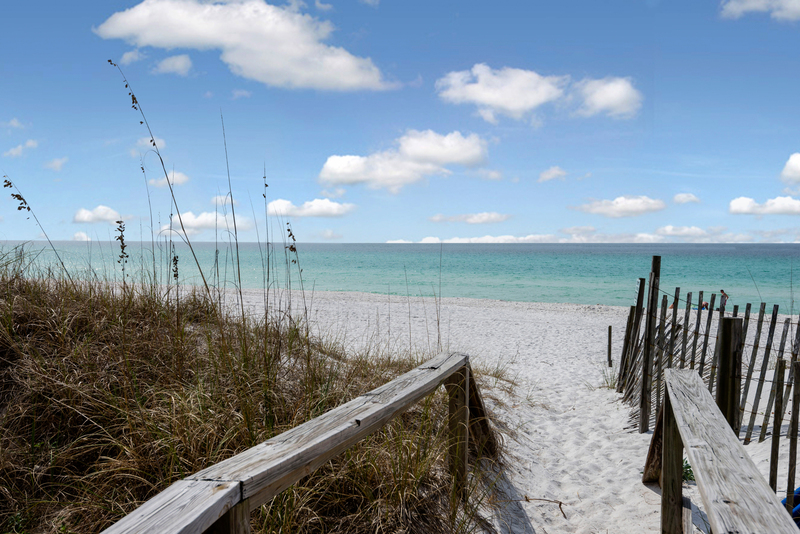 South Walton has been recognized as one of the most influential art communities in the southeastern United States since introducing the Artist of the Year program in 2003. 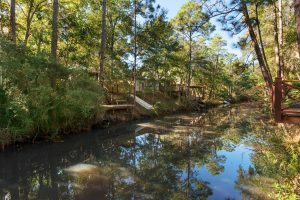 In 2013, Grayton Beach artist Andy Saczynski was selected as the eleventh recipient of this prestigious award. Local residents from Pensacola to Apalachicola also voiced their appreciation for Andy by voting him Best Local Artist in EC Magazine‘s Readers Choice Poll in 2012, 2013, and 2014. Andy Saczynski is a mixed media artist specializing in assemblage art. He’s inspired by Florida’s coastal landscape and wildlife, which are often the themes of his work. His style includes characteristics of cubism, folk art, outsider art, and street art. Given the nature of the materials he uses, each piece is unique, yet recognizable as being his. 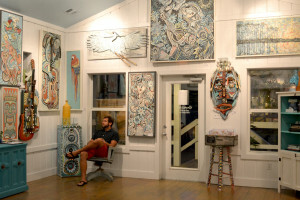 He’s been a professional artist since 2010, and he opened his studio-gallery in Grayton Beach in 2012. His artwork can be found in homes and businesses throughout the United States and abroad. You may have also seen his artwork on Immaculate Baking products nationwide. He even painted a billboard for the company in 2014. Andy has lived in Florida since he was a child, calling the Florida panhandle home since 1985. He and his wife have five children and live in Destin. (I sold them the house they are living in now!) I’ve known the Saczynski family since 2008, and recently had an opportunity to chat with Andy. 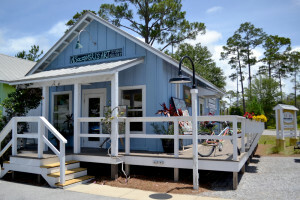 Wendy: Why did you decide to open your art gallery in Grayton Beach? 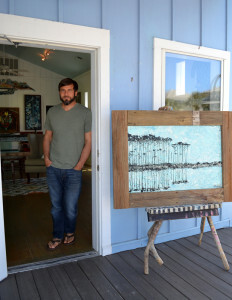 Andy: I’ve wanted to have my own gallery on 30A since I was a teenager. 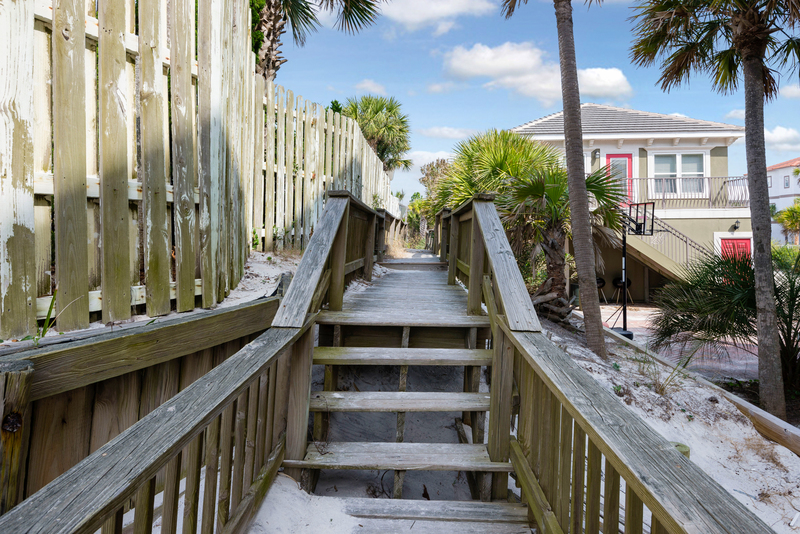 I like Grayton Beach because it feels like Old Florida, it’s not too crowded, and it’s centrally located. I also like the feel of Florida beach cottages, so I was excited when a cottage in Shops of Grayton was available. Wendy: Have you always been an artist? Andy: Yes, I’ve been drawing for as long as I can remember. I never liked taking other classes in school – math, science, etc. I always knew I wanted to be an artist. Sometimes I still can’t believe I’m actually doing this for a living! Wendy: What materials do you usually work with? Andy: Primarily wood as opposed to canvas. I either make mixed media pieces using found objects or I use house paint on wood. I’m just as happy building or painting. Wendy: When you’re not painting, how do you spend your free time? Andy: I’ve surfed since I was a kid. I’ll surf any wave I can get. So, when the Gulf of Mexico is basically flat, I’ll trade my surfboard for a paddleboard. I also like skateboarding. Oh, and I spend a lot of time with my wife and kids. Most of the people in my family also surf and paddleboard. Wendy: Where can people see your artwork? Andy: My studio-gallery is open to the public, but they can also look at my web site. My wife, Lori, makes sure it’s always current. They can either check out available work or look through my portfolio for commission ideas. Wendy: How does it work to get a commission? Andy: I work with individuals and interior designers so that the client can get a custom piece of art in the exact dimensions and colors they want. Check out Andy Saczynski’s artwork. Tell him that Wendy sent you! 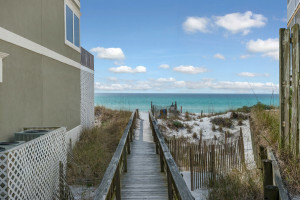 And if you love Grayton Beach as much as Andy does, click here to search for Grayton Beach homes. Sacred Heart Hospital in Santa Rosa Beach Florida was just acknowledged by Becker’s Hospital Review as one of the top “100 Great Community Hospitals” for 2015. Specifically, Sacred Heart Hospital on the Emerald Coast was “recognized in several ways for general excellence“. Sacred Heart Hospital was mentioned for its 30 million dollar expansion, as well as being on the list “America’s 100 Best Hospitals for Orthopedic Surgery”, “100 Best Hospitals for Spine Surgery” Award and “100 Top Hospitals” for three years in a row. Sacred Heart on the Emerald Coast is a 58 bed hospital that facilitates 42,000 outpatient procedures a year, with 4,800 admissions, 28,000 emergency visits, and over 1,100 births! I can tell you, this is a beautiful facility that shines for its service to the Emerald Coast of Florida, Santa Rosa Beach, Destin, 30A, Walton and Okaloosa Counties!! Lovely Santa Rosa Beach Florida Seller Sends Me Flowers! Thank you to my Santa Rosa Beach Florida sellers for the lovely gift of flowers! Their Plantation at Santa Rosa, Santa Rosa Beach Florida home is closing next week. 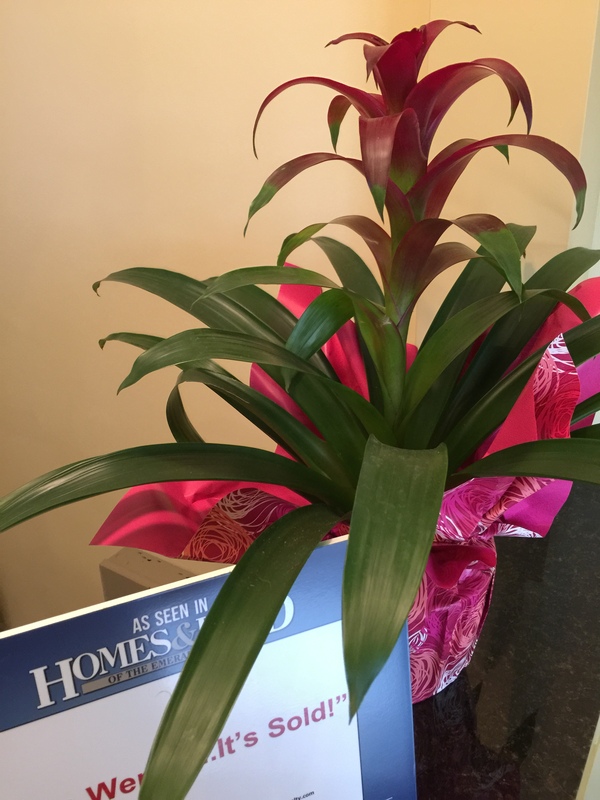 I’ve set this bromeliad on the counter of my Rulnick Realty office and it really brightens it up. Stop by and say “Hello”! 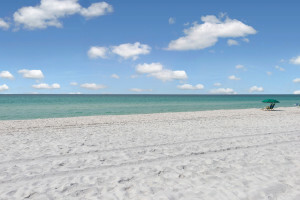 30-A Gulf view half-acre lot for sale in South Walton, Santa Rosa Beach Florida! 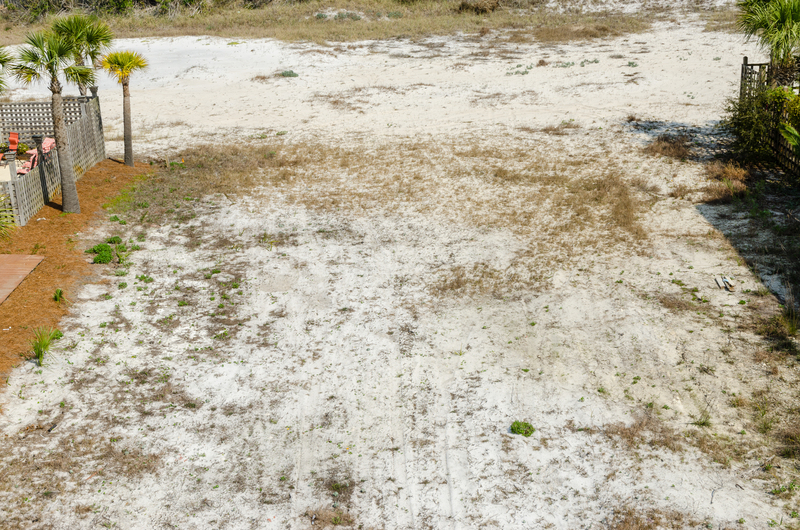 Lot 4 Chivas Lane, in Walkover Dunes, is across the street from the white sandy beach of the Gulf of Mexico near Watersound and Rosemary Beach. 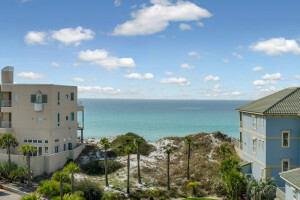 There is an unobstructed Gulf view, private beach walkover and no association fees. This 30-A gulf view Lot #4 Chivas Lane already has tap fees paid for public water and sewer. 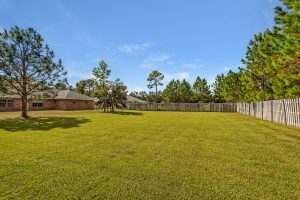 It’s difficult to find a lot of .5 acres in Santa Rosa Beach south of 30-A by the beach. The fact that it’s a private road and small neighborhood add to its appeal. Are you interested in building your 30-A home right away? We also have a builder who can help. Wendy Rulnick, Broker, has been featured in “Kiplinger Personal Finance Magazine” and “Florida Realtor Magazine”. 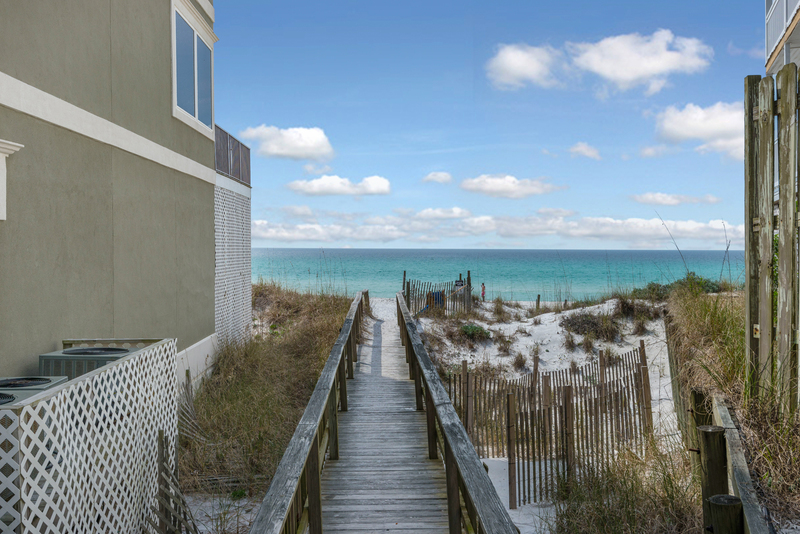 Wendy Rulnick sells real estate in Destin, Santa Rosa Beach, Miramar Beach, Seagrove Beach, Watercolor, Sandestin, Seaside, Crestview, Rosemary Beach, Mary Esther, Shalimar, Fort Walton Beach, Niceville, Bluewater Bay, Navarre, Panama City Beach.